For the most part, picket spacing is a matter of taste. Before you calculate the precise space dimension for your project, clamp or tack a few pickets to your fence rails, and experiment with different spacing to find the look you like best. 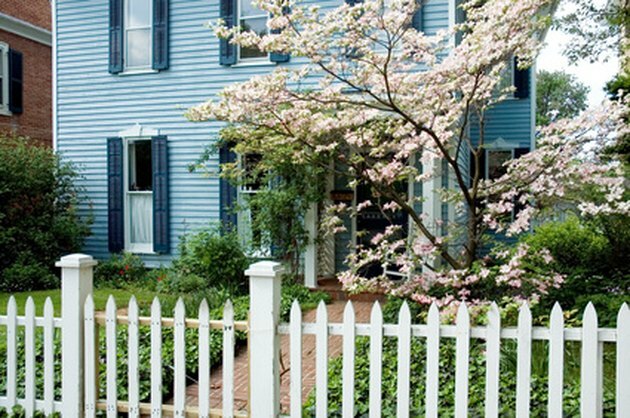 Aesthetics aside, if the fence is intended to contain animals or kids, make sure the spacing is close enough to ensure safe keeping. For kids, follow the standard rule for spacing of railing balusters: all spaces must be under 4 inches, so that a 4-inch sphere cannot fit through the gap. Widely spaced pickets offer more visibility through the fence and a leaner look overall. Measure the distance between neighboring fence posts (assuming the posts are spaced consistently, you can use the same spacing dimension for each section). For example, let's say the space between posts is 92.5 inches. Add the picket width to the desired spacing dimension (determined by your experimentation) to find the unit width. In our example, your pickets are 3.5 inches wide, and you like them spaced about 2 inches apart; the total unit width is 5.5 inches. Determine the number of pickets for each section by dividing the post spacing by the unit width: 92.5 divided by 5.5 equals 16.82. Round up or down, as desired, to the nearest whole number: 17 in this case. Calculate the total area occupied by pickets by multiplying the number of pickets by the picket width: 17 times 3.5 equals 59.5 (inches). Subtract the picket area from the post spacing to find the total area remaining for spaces: 92.5 minus 59.5 equals 33. Divide the total spaces area by the number of pickets plus one: 33 divided by 18 equals 1.83 (inches). This is the precise width of each space between pickets (and between the pickets and posts). Finally, convert the decimal number to the closest 16th dimension on your tape measure: 1.83 is closest to 1 14/16, or 1 7/8 inches. Philip Schmidt has been writing about homes for more than 19 years and is author of 18 books, including "Install Your Own Solar Panels," “PlyDesign,” and “The Complete Guide to Treehouses.” Schmidt holds an English degree from Kansas University and was a carpenter for six years before hanging out his shingle as a full-time writer and editor.